Starting on their backs, babies start to develop their core muscles by moving and waving their arms and legs. As they start to integrate their arms and hands, they may reach for toys or things around them. Eventually they find their feet and grab their toes. This is Happy Baby Pose in traditional yoga. Older children and adults that practice Happy Baby Pose stretch their hips and spine, increasing awareness of the hip joint while relieving stress and anxiety. Once babies are able to roll over onto their bellies or are placed there for "tummy time," they will start to lift their head and chest (Cobra Pose) and sometimes their arms and legs all at once (Locust Pose). Practicing these poses as we get older helps to improve posture and strengthen the muscles of the back body - spine and backs of arms and legs - while stretching the chest and shoulders. It is also great for digestion, stimulating the organs of the abdomen while reducing stress. Lie on your belly with your hands under your shoulders. Reach your toes back behind you and keep the tops of your feet flat on the floor. Lift your head, chest and shoulders away from the floor for Baby Cobra or press your hands into the floor and straighten your arms for Cobra Pose. Eventually, babies will start to work their knees under them while on their bellies, coming into Child's Pose. They may start to rock their hips forward and back and move between Cobra and Child's Pose. Child's Pose stretches our hips, thighs and ankles as well as our back muscles while gently relaxing the muscles in the front of the body. This makes is a perfect pairing with Locust or Cobra. Start in Child's Pose and take a few moments to relax your body and feel your breath moving along the back of your body. On an inhale, slide your torso forward along the floor to come into Cobra Pose. Take a few deep breaths and allow your chest and shoulders to open. Exhale and return to Child's Pose. Continue this sequence with your breathing, inhaling forward to Cobra and exhaling back to Child's Pose. Eventually, babies will push themselves onto their hands and knees into Tabletop Pose. They may alternate between Tabletop, Child's Pose and Cobra as they build their strength. Babies might start to crawl on their knees or army crawl on their bellies. Practicing tabletop and various crawling variations integrates the right and left sides of the body and brain, supports literacy and sensory integration and develops fine and gross motor skills. Encouraging older children and adults to crawl can have tremendous benefits! Start in Tabletop Pose, with your wrists under your shoulders and your knees under your hips. Press into the floor to create space in your shoulders and engage your abs. Extend one arm forward and the opposite leg back, reaching in both directions. Take a few breaths and then switch to the other side. Keep "crawling" while you breathe. Inhale arm and opposite leg lift, exhale hand and knee back to floor. Inhale, other arm and leg lift. Exhale back to tabletop. 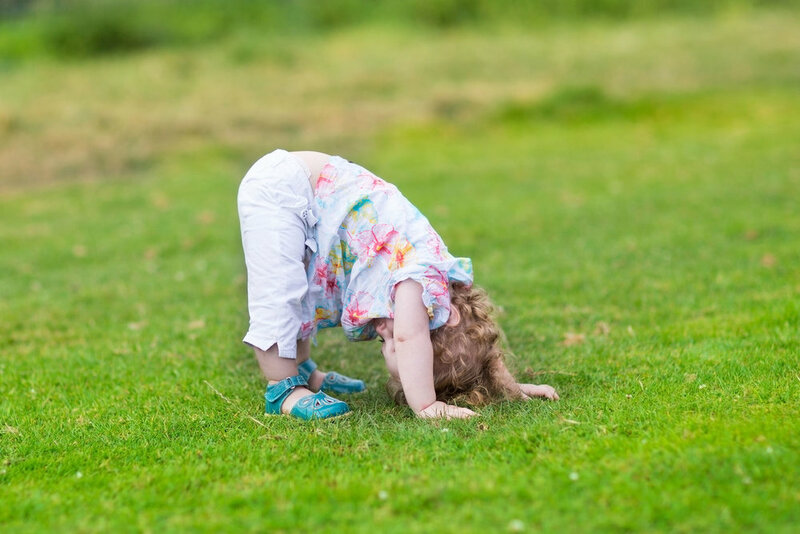 Eventually babies lift their knees up into a Downward Dog pose and may walk their hands and feet together to stand! Downward Dog is one of the most practiced yoga poses and benefits the whole body. It strengthens the arms, hands, wrists, legs and core while stretching the backs of the legs, chest and shoulders. It elongates the spine, improving posture and brings attention to our breathing. It calms the mind and can reduce stress and depression. Start on your back in Happy Baby Pose. Roll over onto your belly and inhale as you lift arms and legs into Locust Pose. Exhale to bring hands under your shoulders and inhale press into Cobra Pose. Exhale back into Child's Pose. Inhale, come forward onto hands and knees in Tabletop and exhale lifting knees into Downward Facing Dog. Inhale as you walk your feet to your hands in a Forward Fold and then exhale, bending knees and rolling onto your back. Repeat. Babies and young children are fully connected to and immersed in the present moment. Most adults could actually take a lesson from the children on this one. So often, our minds are stuck in repetitive cycles, either rehashing something that has already happened or worrying about what hasn't happened yet. But joy and happiness are only found in the present. The easiest way to connect to the present is to bring our awareness to our breathing. Take a moment to close your eyes and observe the sensations of your breath. Your awareness may create space to breathe slowly, deeply and fully. When thoughts come in, release them and return to study your breath. Try connecting to your breathing throughout the day to bring yourself and your mind into the present moment. Combining this breathing practice with these foundational baby yoga sequences can help us all feel more centered, grounded and energized.